Armstrong in the engineering room. 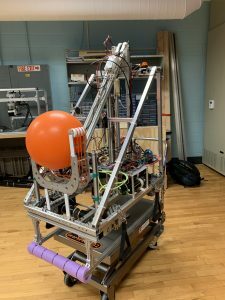 2017-18 Samus: Samus is the name of the 2017-18 robot we used for the FRC Power Up event. She is equipped with a claw for climbing and lifting cubes into the scale and/or switch to score points. She uses an elevator system that telescopes upwards and the arms can raise up to make driving smoother. 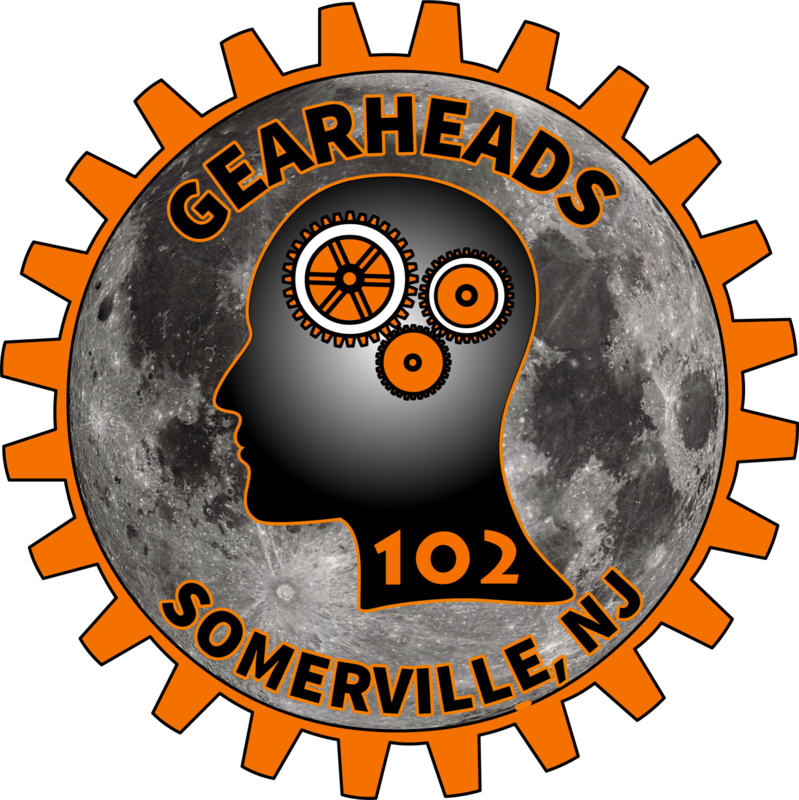 2016-17 David Hopperfield: Named for the fuel hopper on his back, David Hopperfield was the Gearhead’s robot for Steamworks. Dave sprinted around the field delivering gears to the airship and collecting fuel. His winch system allowed him to climb aboard the ship for take off. Dave was able to secure a win at the Greater DC event. 2015-16 Enodia: Enodia was the name of our robot for the FRC Stronghold in 2016. Enodia is designed to breach defenses in various ways to get the most consistent and amount of points each game. The team had thought about different strategies to use, such as scaling, breaching, shooting in high goal only, shooting in low goal only, shooting in both goals, defending, and capturing for about three days. The team also had everyone read and understand the rules of the game to maximize the speed of the build and to prepare the students to talk to officials or judges during competitions. Enodia had its own bugs that were easily overcome, such as screws coming off when going over defenses. The objective of this robot will be to go over 4/5 defenses (portcullis, low bar, sally port, drawbridge, etc.) on the field twice in two minutes and thirty seconds. 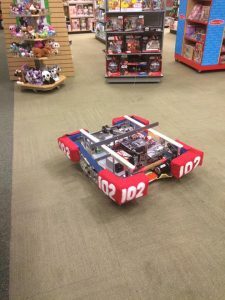 2014-15 Wally: Wally was likely team 102’s most unique machine. Wally featured a turn-table with 4 arms meant to collect the shared recycling bins during the autonomous period. While the strategy was sound, Wally had many troubles throughout the competition season. Despite the troubles, Wally was honored with the Innovation in Control award, and the Creativity award twice. He also still made it to the World Championship event in St. Louis where he had fun playing the game! 2013-14 Beyonce: This robot was built to compete in the 2014 game Aerial assist. It was designed to be able to shoot and pass to other robots and human players. However, the shooting mechanism never worked properly. During the build, the mechanical team came into an issue where the conveyor belt was not strong enough to launch the balls out. This robot was almost maximized to the maximum robot height being five feet. This game was about using your human players and alliance robots to score and gain the most points. The electrical team was basically self-teaching themselves to use the new RoboRIO system. 2012-13 Chewie: This robot was built to play Ultimate Ascent in 2013. This robot gathered frisbees from the human player, drove to a protected shooting zone, and shot frisbees into the high scoring goal. This worked well. 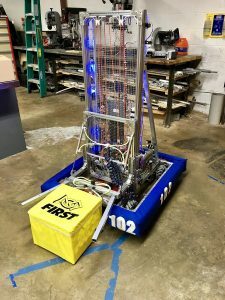 The robot was also equipped with arms that could be used to climb up the corner of the pyramid and score points in the endgame period of matches. The pyramid consisted of three levels. The robot was fine at climbing the first level, but despite being designed to climb higher no attempts at this ever ended well. 2011-12 Athena: This robot was built to play Rebound Rumble in 2012. The goal was to pick up basketballs, drive to a protected scoring area, and shoot them into one of the baskets. Towards the end of the match, the robot was designed to climb onto a balance bridge and balance with the rest of the robots on the alliance. The robot was plagued with problems from early in the competition season. For its first few matches, it never moved. When it finally did move the tank drive, designed to get the robot over a tall bar in the center of the field, made it hard for drivers to line up the correct distance from the baskets. The bungee cords used to launch the balls proved unreliable and what worked consistently on the practice field never seemed to work on the real field. Finally, the top-heavy robot was very difficult to balance on the bridge and it frequently fell over in the attempt. It never made it to the elimination stage of a competition. 2010-11 Tinman: This robot was designed to play the 2011 game Logomotion. The robot used a telescoping elevator and deploy-able arm with a claw at the end. The goal was to pick up inflated tubes from the ground and hang them on the highest pegs to score the most points. In the endgame, the robot was designed to launch a mini-bot to climb a pole. The robot had mixed results. The design of the claw required the robot to be centered on the pieces which took time to do. Additionally, the parts of the claw often fell of the robot during matches, and despite constant work, the mini-bot never consistently launched. The robot did find success acting defensively and made it to the finals of the New Jersey Regional. At the Philadelphia regional that same year it did not even make the elimination rounds. 2008-09 Lunacy: The floor this year was a mildly slippery material, and we had to pick up hollow balls which deformed easily. We picked them up with rollers and then deposited them in baskets for points. These baskets were being towed by opposing robots. 2004-05 Shocker: Shocker involved a nested telescoping elevator system to manipulate large PVC tetrahedron game pieces. Shocker quickly and effectively placed the game pieces atop the field pyramids to secure points. 2003-04 Captain Hook: Hook was an interesting robot who spent most of its matches climbing stairs. The playing field involved 2 tall steps up to a chin up bar mid-field. The Captain used pneumatics to scale these steps and hang from the bar. 2002-03 X-wave: X-Wave will forever be remembered as one of Team 102’s greatest robots. X-wave had a unique expansion system that allowed it to drive up the ramp in autonomous and secure most, if not all, of the game pieces in the first few seconds of the match. X-Wave was very powerful and on more than one occasion, flipped robots that were coming up the other side of the ramp. Most of the matches that X-wave played were won during the autonomous period and ended triumphantly atop the ramp, secured in place with its foot. 2001-02 Firewire: Firewire played the 2002 game, Zone Zeal. Firewire had an efficient, telescoping conveyor system to pick up and score the soccer balls that were on the field. Firewire was capable of towing 2 goals in the match making it difficult for opposing teams to score.